So, to continue this series of conversations, here is David Darg, director of Sun City Picture House. Synopsis: After watching the last of the old movie theaters get destroyed in the Haiti earthquake, a young Haitian man rallies an entire community to build a cinema and make his dream come alive on a hill above a tent city. David Darg: After college I started making short films for humanitarian organizations, documenting various projects around the world for donor feedback. It started with very basic project reporting, but as my understanding of humanitarian issues grew, so did my interest in the root cause of poverty and conflict. So my filmmaking began to take on a more investigative style, and I started working for an NGO that allowed me to do backpack-style journalism on the front lines of disasters. For the past seven years I have responded to natural disasters and wars all over the world. Sometimes I will stay in a country for just a few weeks or months, but on larger disasters I have lived in places longer. In 2008 I lived in China for a year after the Sichuan earthquake and documented a project to rebuild an entire village that was destroyed. In 2010 I arrived in Port Au Prince, Haiti, 48 hours after the earthquake, and I have lived there ever since. In Haiti I was documenting emergency relief projects for the first several months, but I now work on longer format stories about the nation's recovery. Using Haiti as a launch pad, I was recently in Japan for a month documenting the aftermath and emergency response to the tsunami, and most recently I entered the sealed-off war zone of South Kordofan in Sudan to document the unfolding genocide happening there. IDA: What inspired you to make Sun City Picture House? 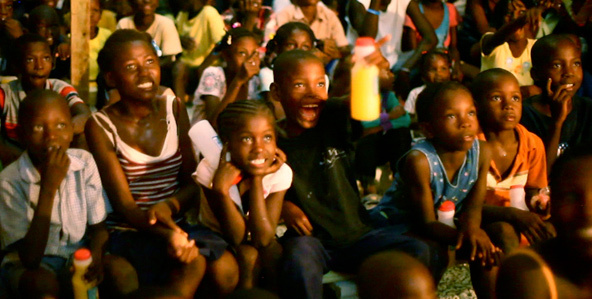 DD: Producer Bryn Mooser and I started showing films to Haitian children in some of the large tent cities at night. We took a projector and sound system and threw up a white sheet, and the kids loved it. It gave them some escape from the horrors of the earthquake and their surroundings in the camps. At the same time, one of our Haitian colleagues named Raphael took us to see some of the collapsed movie theaters in Port Au Prince; after the earthquake, there were literally no movie theaters left. Raphael had a dream to build a movie theater again and we promised him we would help him build it. So the project started and we knew that we had to document it. But the main inspiration for us in making the film was to show the "real" side of Haiti that we see every day, a different story from the one shown in the news. The news media only seems to paint a negative image of Haiti--that it is doomed to failure. In Sun City Picture House we thought it was important to address some of the issues that definitely make Haiti a difficult challenge, but it was important that the "Hope" of Haiti shines through. Every day we are inspired by the beauty of Haiti and the Haitian people; we see constant development, improvement, joy and hopefulness, and that is the message we wanted to convey in Sun City. DD: The whole project happened so quickly that we didn't have time to plan anything. Bryn and I were helping to build the movie theater and having to shoot simultaneously. It was still grueling working long hours in the day and dumping and reviewing footage at night. The edit was also tough because we had our full-time day jobs: Bryn was working on an education project and I was coordinating clean water projects. We would get together and edit in the evenings--sometimes in Bryn's tent! On occasion we would work on a complicated edit and the power would go out and we'd lose a bunch of work. It was about as down and dirty as you could ever hope to get on a production. When you watch the film you realize that there is a huge dichotomy of emotion from the absolute darkness of the city morgue to the joy of the children in the theater. Transitioning between those themes in 27 minutes was quite a challenge, but the contrast is so worthwhile and important. IDA: As you've screened Sun City Picture House--whether on the festival circuit, or in screening rooms, or in living rooms--how have audiences reacted to the film? What has been most surprising or unexpected about their reactions? DD: We've had a fantastic reaction from audiences. It's definitely a feel-good film, and viewers seem to get really uplifted by the message. The most rewarding reactions have been from Haitians who have thanked us for the film's message. It's really wonderful to be ambassadors for Haiti in that respect. Many viewers ask us how they can get involved in supporting Haiti, so the film has definitely motivated people to take action. Sun City is a bit of a tear jerker, and I've seen grown men wiping away tears as the house lights come up. Even though I've seen it more times than I can remember, I still tear up a bit every once in a while at the end. DD: Asger Leth's Ghosts of Cîté Soleil is one of the most powerful feature docs I've ever seen, and it came out of Haiti. Filmmakers like that who put themselves in the most dangerous situations imaginable to tell the story are quite inspirational. I'm very inspired by the photographer James Nachtwey; when the War Photographer documentary came out, it had a big impact on my thinking. It's true that those of us on the frontlines of wars and disasters have a big responsibility to tell the story well, as we are witnesses to history unfolding. Often times those oppressed by war or disaster have little chance to have their voice heard, so that is where Bryn and I want to focus our efforts--to give them a voice through film. Our website is www.ryot.org, where we regularly post short films we make from around the world with the aim of spreading awareness and giving a voice to the voiceless. Sun City Picture House will be screening August 19 through 26 at the Laemmle Sunset 5 in Los Angeles. To purchase tickets for Sun City Picture House and the rest of the films in the DocuWeeks Los Angeles Shorts Program, click here.